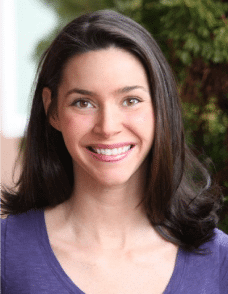 Have you ever strolled through your local health food stores beauty aisle, picked up a bottle of sulfate-free shampoo that says something like “made with pure acai berry extract,” then looked up the ingredients when you got home and realized they were flagged as likely to be harmful by the Environmental Working Group? It’s frustrating for sure, but over time I learned to decode a label in no time. We have a ways to go before some beauty companies come clean, but there are also some great ones out there. 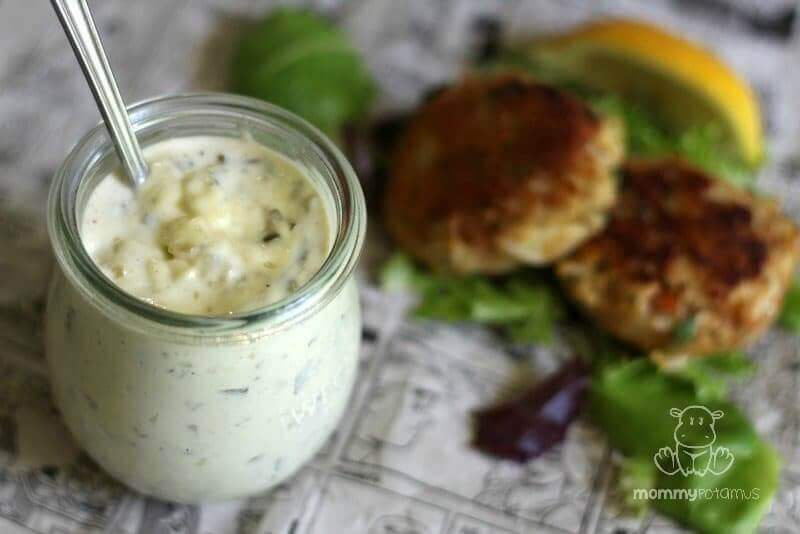 In this post I’m going to share a few of them with you, along with tried-and-true recipes I use to make my own products with 100% pure, natural ingredients. It’s easier than you might think! This three ingredient body wash recipe creates a rich, bubbly lather that moisturizes while it cleanses, and you probably already have everything you need to make it in your pantry! Two other options are this luxurious pure coconut oil soap that can be made in a crockpot (again, only three ingredients!) and this nourishing sea mud soap. Though not technically cleansers, sugar-based scrubs contain naturally occurring glycolic acid – a hydroxy acid that dissolves old, dead skin and makes exfoliating easy. The warm vanilla scent of this sugar cookie scrub makes it one of my favorites – I also love this uplifting citrus version. 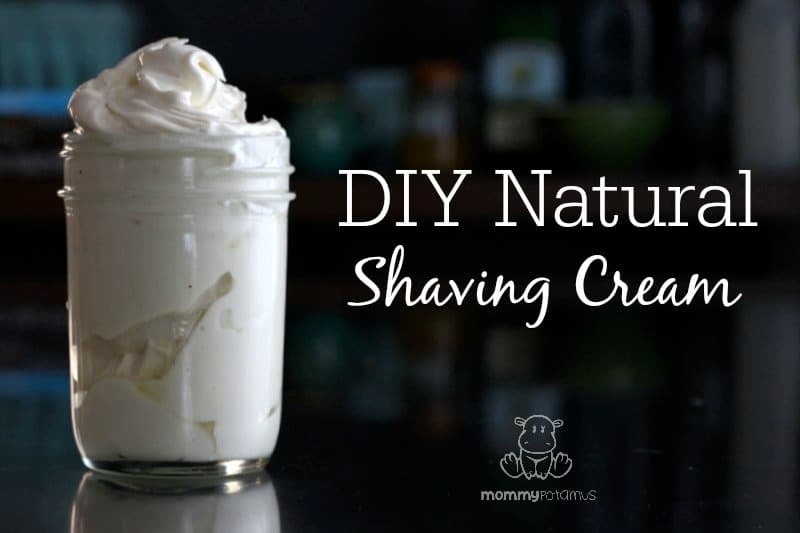 Another recipe for the bath/shower that I use is homemade shaving cream. It nourishes and protects without the use of foaming agents and hormone disruptors often found in store-bought varieties. Another option is to wash your hair with MUD, er, clay. Yes, really! Here’s how. On days you technically have to skip the suds, you can “wash” your hair with dry shampoo. By absorbing excess oils, it transforms limp, oily strands into voluminous, grease-free tresses in just a matter of minutes. Here’s how to make a powdered version, and here’s my spray formula. Both call for the same basic ingredients and together they’ll take about five minutes to make, so it’s easy to try them both. If there are tears over tangles at your house, here are three detangling recipes that are inexpensive and easy to make. This coconut milk leave-in conditioner softens and hydrates without weighing hair down, and it only takes minutes to make. The keratin proteins found in this gelatin hair mask bind with strands to strengthen them, boost shine and reduce breakage. This quick and easy hair gel is great for naturally wavy and curly hair. For those looking for a light/medium hold hair pomade to tame flyaways, here’s the recipe I use on my son. 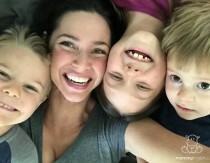 For a texturizing spray, check out this recipe from Wellness Mama. Morocco Method has an amazing line of shampoos made with high quality ingredients. It doesn’t lather like most store-bought shampoos, but it cleans hair and leaves it soft. 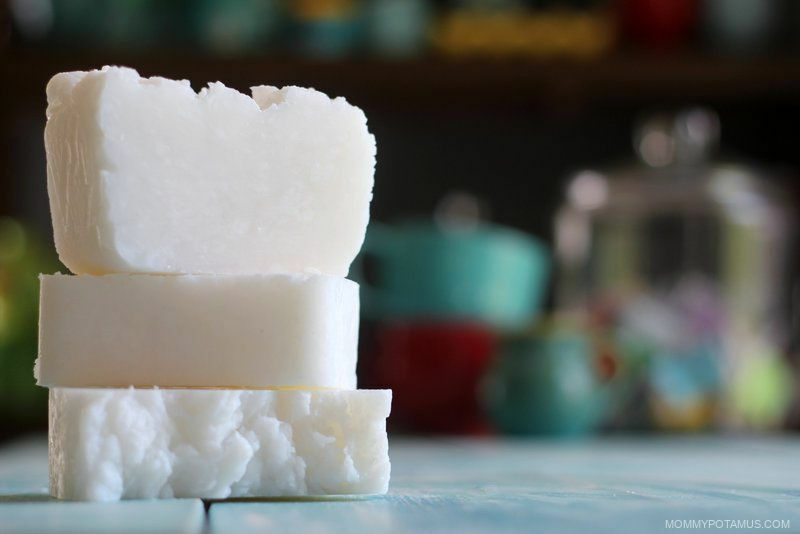 Tropical Traditions sells a coconut oil shampoo bar that is similar to my homemade version. It does lather, which I like. For henna-based dyes with clean ingredients, I recommend Morocco Method Morocco Method. 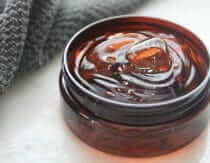 For other personal care recipes and recommendations, check out my DIY beauty section and shopping list. I’m also planning a makeup list at some point, but for now I have just a few mentioned in this post. I just simply use water and hypo-allergenic soap for my skin. I can’t stand to have it and even afford to apply all of this eight products. I’m always in a hurry and don’t want to stay long in the bathroom. I never use to being that so delicate when it comes to my skin but still consider myself lucky then for I don’t have flaws on my skin. I have been brushing my teeth with either baking soda or tea tree essential oil for the past 8 years. Thank you, Paxton! I wrote a post awhile back about Miranda Kerr and her love for coconut oil – so glad to see more good stuff coming out of her blog! I so love your site, i just spent a better part of the morning reading all of your recipe’s, watching your tutorials and now am heading out to shop for ingredients. where have you been all my life. Thank you thank you thank you! It’s every women’s passion to greatly take care of their appearance and even health so this leads each ladies to have the idea of the basic consideration that we must have to totally have that great result and effect. Apple Cider Vinegar is great for hair, and it can smell when it’s wet. I’ve been using it for years now, and I can attest to the fact that as soon as it’s dry, the smell goes away. Baking soda, however is too harsh for your hair. I know that it’s a fad going on right now, but baking soda is an 8 or a 9 on the pH scale, while hair is 4.5. ACV is around 3, but if you mix it with water, which is 7, it’s perfect! Try using a hard nut butter like kokum butter instead of wax when making your lip balm. I’ve never tried to substitute it straight across but I imagine with a little tweaking you could get something that would be the right consistency. Email if you have questions and good luck! OK Mommypotamus (love it), here goes. I tend to get an itchy scalp so I use Dr. Bronner’s tea tree flavor. It has worked great. I no longer have to use head & shoulders and such. I scrub up and use the lather as a shower gel for the rest of me. It works well for laundry too, along with peroxide, vinegar and baking soda. I’m wondering, though, about how migrating away from soap, at least instead of bar soap. I was just on a trip, and I used aloe vera gel (purchased from CVS, not organic or anything). It seemed to work fine. That’s how I found your site – I was looking for a recipe to make it from scratch with aloe vera juice. Interesting, Marie! Let me know how the aloe vera experiment goes, please! I’m curious…I want to transition myself off of coloring my hair (just can’t accept too much gray yet), as well as “store bought shampoo and conditioner. I’ve started taking unsulphered molasses internally and plan to use it with honey as a conditioner to hopefully restore the color. 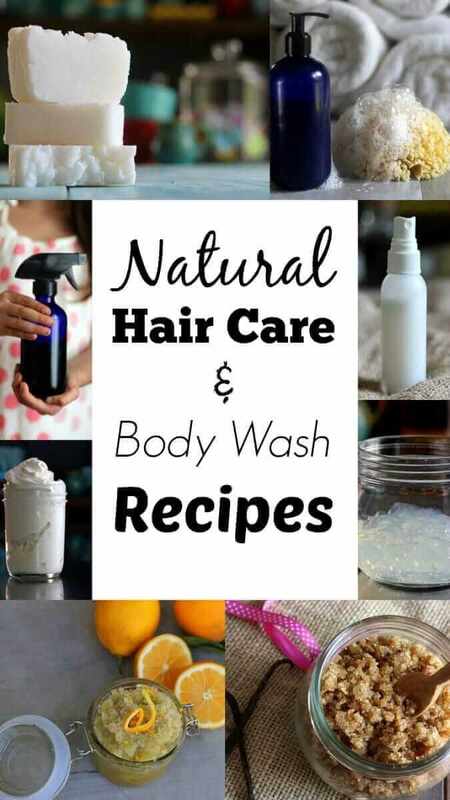 My question is….so far the recipes for shampoo that I’ve seen here, as well as in the DIY Beauty Recipes book say that they are not safe for chemically treated hair. What does that mean? Does it mean that they would strip the color out (which would be the intent right?) or does it mean that my hair will turn some sort of funky color? I’m willing to live with some detox results for a few weeks while my hair adjusts, I’m just not willing to come out with some crazy colored hair and I’m wondering about the best way to transition. Any info you can provide would be deeply appreciated! Hi Nicole! Because the pH of soap is alkaline it opens up the hair shaft and allows dyes to leak out during washing. It won’t affect your natural color or change your hair color, though. The only exception is with honey, which **can** theoretically lighten hair because it contains a small amount of naturally occurring peroxide. I use it on my dark hair, though, and have never noticed it having this effect. Hope that helps! I have your book DIY Organic Beauty Recipes and I love it. I just had a quick question about sweet orange and honey shampoo. Is it supposed to lather?? I always wonder if I’m not using enough because mine doesn’t but I’ve heard castille soap usually does. Just FYI I love the deodorant and the baby diaper cream is amazing. I’ve also made both the tooth soap and powder. I like the tooth soap but don’t like the aftertaste. I think I may add either some more essential oil or maybe some cinnamon. Hi, just wondering if the color issue also pertains to blonde highlights? I’m assuming not since it’s bleached rather than a dye added in. Thanks! I haven’t tested this, but I think highlighted hair would be fine! 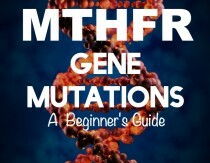 I just found your website and am interested in buying your ebook! However, I do color my hair, and I just can’t give it up yet. I’m only 39 and have mousy brown-gray hair. Not pretty. However, as I was reading, I saw apple cider rinse or homemade shampoo isn’t safe for color treated hair. Do you have other alternatives in your book? Thank you! Acacia powder works amazing to clean hair. It has a pH of 4 when mixed with water. It would be good for colored hair. I LOVE the way it makes my hair feel after a shower; however, it can be a little messy and it’s definitely not tear-free. I just asked my hairdresser about this today. I have highlighted hair. She said ACV is fine but distilled white vinegar would not be good for colored hair. She did not think it would be a problem to try using a more natural shampoo product. She’s Aveda trained, if that means anything. A tip for blondes on switching from shampoo/conditioner to baking soda/apple cider vinegar- I found that rinsing with ACV made my hair turn a much darker shade of blonde than it had previously (or ever) been. I substituted ACV for regular vinegar to deal with the color issue and so far there haven’t been any complications. This may not be the case for all blondes but it is nice to know there is an natural alternative. 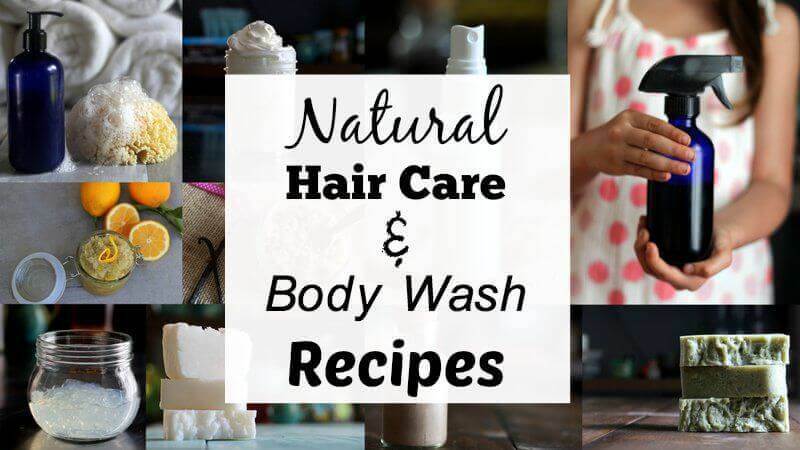 I’ve been trying various homemade shampoo recipes with lots of interesting results. One gave me a build up eventually that was like dandruff – yuck! The bentonite clay left my hair like a birds nest. I bought your book recently and I tried your detox last night. Hair felt great. Used the honey shampoo and it still felt great. Added the ACV rinse and it felt stringy but I figured it would dry and feel better. This morning it’s super greasy! Would it be a bad thing to skip the ACV sometimes? I’m about to give up and go back to Suave or something if I can’t figure this out soon. Help!!! Before I shell out $25 to buy the book for the single recipe of the orange and honey shampoo, can someone tell me if castile soap is one of the ingredients? I have color treated hair and castile soap strips the color…no matter how I’ve diluted it! Thanks for your quick response. I applaud your site, and enjoy it very much!! 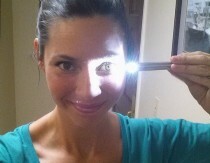 Is there a natural way to darken your eyebrows? I am curious if I can use this as a body bar also. Looking for a solution for an all in one soap bar. Any ideas? Hi Mommypotamus! Your website is amazing and very helpful. And i need your help to make my desired product. I am looking for a recipe hair color wax. I have watched your pomade recipes but i want to make natural hair color wax and the texture should be creamy, non-sticky and non-greasy. i am hoping you will help me out. Desperately waiting for your reply. And kindly tell how to contact you via email?